When the Twain scholar at Auburn University and the editor of NewSouth books, Alan Gribben, announced his editions of Adventures of Huckleberry Finn and The Adventures of Tom Sawyer would be published without the use of the n-word or the i-word (injun), I was stunned. Gribben explained that teachers in politically correct school systems had asked for it and that he had already been substituting in words at readings: "For nearly forty years I have led college classes, bookstore forums, and library reading groups in detailed discussions of 'Tom Sawyer' and 'Huckleberry Finn' in California, Texas, New York, and Alabama, and I always recoiled from uttering the racial slurs spoken by numerous characters, including Tom and Huck. I invariably substituted the word 'slave' for Twain's ubiquitous n-word whenever I read any passages aloud. Students and audience members seemed to prefer this expedient, and I could detect a visible sense of relief each time, as though a nagging problem with the text had been addressed." The audacity of this quote astounds me. Gribben has appointed himself editor and re-writer-in-chief of Mark Twain. Unbelievable. I begin with this anecdote to provide an analogous account to the same sort of nonsense going on within the world of the Hollywood musical. 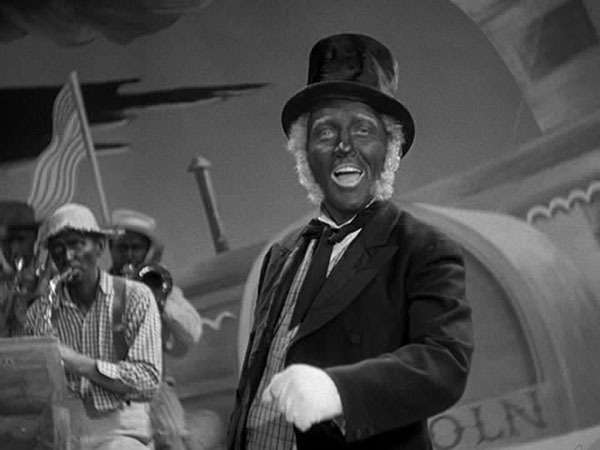 As many of you know, several distributors and television stations excise blackface scenes from such films as Holiday Inn. I would like to voice my support of TCM, Turner Classic Movies, who refuse to cut movies and insist on airing the original version. Now why am I so adamant about this point? If a word or a scene offends people, isn't it best to remove it? No, absolutely not, and I'll tell you why. First and foremost, the work of art exists in its finished form, which must be preserved. Just as we would not carve into a Michelangelo sculpture to create a nose that is more appealing to our age so to we should not cut into novels or films. Because these latter art forms are conducive to such tamperings does not mean we should do such. Second, art exists as a historical document of an age. It is important for us to have an accurate reflection of that moment in time regardless of whether or not we approve of it or feel comfortable with it. In fact, our very discomfort with certain words or actions is criticial to our growth, sensitivity, and understanding as human beings. One of the primary reasons for studying history, for studying the mistakes of our past is to insure that we do not repeat them. We need to examine the painful moments, the decisions of our artists, in order to learn from them. If we erase the chapter on Adolf Hitler, the rise of the Nazi party, and the role of anti-Semitism from novels or films that mention such, then, yes, we erase some agonizing chapters or scenes but we also erase cognition, recognition, abhorrence - these realizations take us to a higher moral plane in which we argue "never again." Art shouldn't always be comfortable. Indeed, the best art isn't. The best art challenges us, reminds us, encourages us. It speaks to us about what it means to be human, explores human frailty, and empowers us to learn, change, and grow. Musicals such as Holiday Inn and The Jazz Singer are historical artifacts and teach us historical lessons. They must not be bowdlerized to meet contemporary tastes. We must be made uncomfortable, and therefore be sensitized and educated. Yes, it is true: it is difficult, even cringe-worthy to watch one of our most lovable singers, Bing Crosby, don blackface and sing "Abraham." But it is also true that in watching this number, we learn something about America and our less than perfect past. And this lesson is the most important of all. It is the only chance we have for a more perfect future.